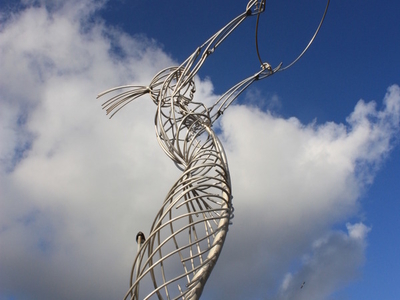 The Thanksgiving Statue is a £300,000 public art metal sculpture by Andy Scott 19.5 metres high constructed in 2007in Thanksgiving Square in Belfast. As with other public works of art in Ireland the sculpture has been given several nicknames. These include the Beacon of Hope, Nuala with the Hula (credited to Gerard Doyle), the Belle on the Ball and the Thing with the Ring. 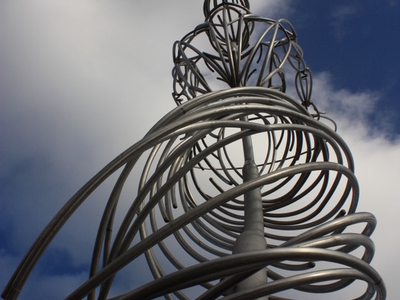 It is currently the second largest public art sculpture in Belfast, after Rise on Broadway Roundabout. The sculpture is the result of six years of planning, development and eventual fabrication. Made of stainless steel and cast bronze, she spirals upwards and holds aloft "the ring of thanksgiving". The globe at her feet indicates the universal philosophy of peace, harmony and thanksgiving, and has marked on its surface the cities where the people and industries of Belfast migrated and exported to. The sculpture was fabricated by P.F. Copeland of Newtownabbey, who worked from original scale maquettes by Scott, with the bronze globe cast by Beltane Studios in Peebles.As an icon for Belfast it has been adopted by Belfast City Council, tourism authorities, TV companies and several businesses as an emblem and logo; and in early October 2006 was recognised as the best artwork in the city by the Belfast Chamber of Trade and Commerce. The artwork is based on a concept proposed by Myrtle Smyth,who was inspired by Thanks-Giving Square in Dallas in Texas. Lord Diljit Rana, Baron Rana, chairman of the Thanksgiving Square charity, said the aim of the project was to create some public space for giving thanks. 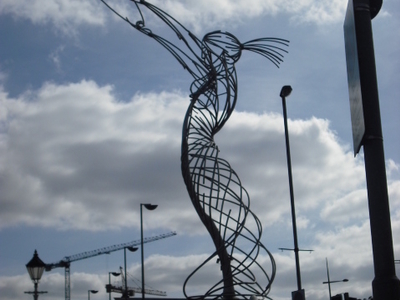 Here's the our members favorite photos of "Sculptures in Belfast". Upload your photo of Beacon of Hope!